This is a Snoot for the Altman Inkie Fresnel light. 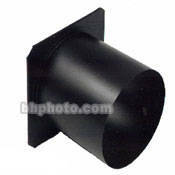 Use of a snoot will result in a small circle of light when it is attached to the front of your light source. The size of the circle of light will be determined by the opening of the snoot, its length, and the distance of the subject. Snoot for Inkie is rated 5.0 out of 5 by 1. Rated 5 out of 5 by tkr66 from Good things still never change I bought this to update my Altman INKIE that I purchased back in 1968. I had concerns that there would have been changes in design or sizing to this snoot over the years. I knew when I purchased it that B & H would have worked with me had it not fit or had its standard of quality been questionable. It still fit and the quality of construction of the snoot was at the level you'd expect back in the 1960's !! It (like the INKIE) was built like a tank. Once again B & H has saved the day by offering a well made product and by sticking with a company who does the same.